…One of these contributions was the temporary restoration of tactical mobility as a technique to the battlefield. However, they were not responsible for the propagation of the incorrect lessons, although they may have fallen victim to the same lessons. 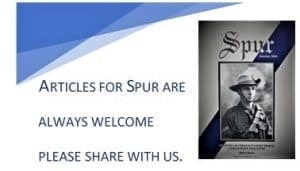 Such lessons include the dependence upon the horse for continued tactical mobility on the modern battlefield using a very specific and limited experience in the Middle East. What is significant about their participation in the Middle East is their particular approach to war. The Australian approach to war was a result of their particular geographic and cultural conditions. At the turn of the century, the Australians were imbued with values now attributed to the typical Australian. The effects of the Australian pastoralist on their society were important in developing pioneering traits. Even those Australians who were not from the outback enshrined these values so that it became an accepted ideal of all Australians. While a large number of the Australians were not from the outback, they all shared an affiliation with their Walers. Perhaps it was a sign of the times, but the horse was important to the Australians who used them as livelihood in the outback and for transportation. The familiarity of the Australians with their horses became an attribute during the conflicts in which they participated, both in South Africa and in the Middle East. This familiarization with horses reflected a general set of rural values that Australians developed as part of their cultural traits. 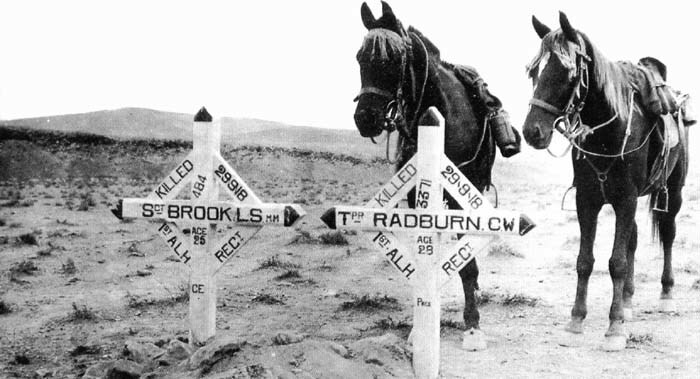 Graves of two men who were among the last of the 1st Light Horse Regiment killed in the Middle East campaign. Even in death the regiment regarded the soldier and his horse as a team. The joint conduct of the Boer War with the British Army gave the Australians a jaundiced look at the British method of operations. What came out of the Boer War was a heightened appreciation for the Australian’s skills by the British and the Australians themselves. Significant to the Australians was the experience gained by its army, which fought entirely as mounted infantry in South Africa. This experience provided a powerful basis for the approach to the military and the preparations for the next war. The Boer War served to justify the Australian tactical methods and made the Australians wary of the British, who failed to adapt quickly enough. The Australians gained an insight into the differences between their methods and those of the British. Some differences were deeply rooted in cultural development such as their respective views of discipline. While discipline in the British Army was manifested in a number of forms to include saluting and dress, the Australians rejected these formalities and considered traits such as loyalty to their “mates” and deeds as the true demonstrations of discipline. This difference was not always understood by their British cousins with whom they worked in the Middle East and Europe and was a source of friction between them. The conduct of the war in the Middle East quite clearly demonstrates examples of how the Australian traits were practiced successfully. The campaign in Egypt and Palestine forms an interesting example since both the British and Australian mounted forces fought against the same enemy there. Both faced very similar conditions, such as the terrain, weather and the general situation. The British demonstrated that they could not exercise the same initiative and flexibility as the Australians when all other factors were alike. On the contrary, while it was not the intent of this study to prove such, the British clearly demonstrated inflexibility. It is interesting to note that in World War One, both the British and Australian mounted units in the Middle East fought the same enemy under the same circumstances. What makes this comparison valid are the common factors of the terrain, situation and enemy. While these factors were key, they were not the cause of the successes for the Australians. For example, the terrain contributed to the tactical success of the Australians but it could have done as well for the British. It happens that the Australians were able to take advantage of the situation. The terrain provided an environment which allowed the Australians to exercise their traits. However, the terrain was only a contributing factor, not the cause, for the initiative and flexibility demonstrated by the Australians. The desert environment only provided a conducive setting for the Australians to practice those attributes that they already possessed. Analysis shows that the British failed to perform in the same manner as the Australians. The Australians clearly set the precedent in actions, not in a single case, but over an extended period of time and in a number of actions. At the Battle of Romani, Chauvel demonstrated a high degree of initiative which was not complemented by a participating British commander. Chauvel strove to take advantage of a unique situation during the battle by replacing his troops with those of British infantry. The Australian’s understanding of the intent of the overall plan facilitated his actions without specific guidance from the commander, Lawrence. The Australian commander demonstrated flexibility by using his mounted troops to extend his flank. Both traits are clearly present in Chauvel’s handling of his brigades during the fight. 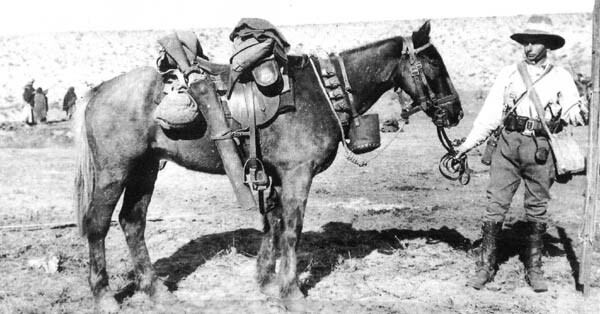 Again at Beersheeba, the Australian commander of the 4th Light Horse Brigade exhibited the distinct characteristics of initiative and flexibility. When placed in very similar circumstances, it was the Australian, Grant, not the British commander, that stepped forward and offered a solution to the difficult problem. Grant’s ability to adapt to the situation caused the conduct of a decisive cavalry charge by mounted infantry which had major lasting effects on the remainder of the war in the Middle East. The last major battle of the campaign at Megiddo is an excellent example of how the Australians not only affected the statistics of the campaign, but the operational employment of mounted forces as well. It was the Australian commander of the mounted forces, Chauvel, that launched his corps into the operational depth of the enemy’s defences. It was the Desert Mounted Corps that was able to exploit the destruction of the Turkish armies in a major operation which culminated in the capture of Damascus and the pursuit of the Turkish forces to the Taurus Mountains. During an engagement in the Megiddo battle at the village of Semakh, the Australians demonstrated their tactical flexibility by quickly reverting to their mounted infantry role. This happened even though they had been armed with the sword and legitimately reclassified as “cavalry”. They were not inhibited from adapting to the situation and fighting with rifle and bayonet when it was required. There exist no examples of the British cavalry doing the same, although their doctrine provided for such actions.